These are cheques for personal bank accounts, that you fill out by hand. Pay far less than what your bank charges, and our Personal Cheques are guaranteed to be fully compatible with all Canadian Banks, Credit Unions and caisses populaires or you receive a 100% refund. This premium cheque paper is loaded with security features! Single Personal Cheques: side tear to fit in most chequebooks, 50 (2 books) up to a maximum of 200 (8 books) per package. Each chequebook contains 25 cheques + 2 cheque register sheets. Duplicate Personal Cheques: side tear to fit in most chequebooks, 40 (2 books) up to a maximum of 80 (4 books) per package. Each chequebook contains 20 cheques. Can I make my own personal cheques? Yes, but in most cases it is not practical. You would need to purchase suitable blank cheque paper, magnetic ink or toner and a compatible laser or ink printer if you don't have one already. Plus there is some extra hassle in setting it all up. And there is some risk because of the cheques you make yourself are not compatible, the bank can charge you a service fee for each rejected cheque (could be $1-$4 each !) plus it could delay processing the cheque. What constitutes a personal cheque? 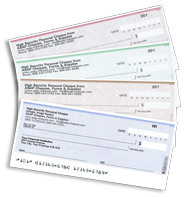 Personal cheques are much smaller than business cheques - usually 6 1/4" wide by 2 3/4" high. Personal cheques do not have room to encode a check number longer than 3 digits, making them unsuitable for most business accounts. Can you print your own cheques at home? Yes, but it rarely makes sense to print your own at home. Printing your own cheques requires suitable blank cheque paper, magnetic ink or toner and a compatible laser or ink printer if you don't have one already. Note that there is some risk because if the cheques you make at home are not compatible, the bank can charge you a service fee for each rejected cheque (as much as $4 each! !) plus it could delay processing the rejected cheque. They got the wrong address printed on my cheques the first time but the representative sent me new ones right after. Transaction was seamless and at a good price. Would definitely purchase again! I found the process of ordering cheques online through ASAP Cheques a lot faster and more convenient than going to my bank. They were also significantly cheaper so that was a bonus. I particularly liked being able to check that all the details were correct before completing my purchase.